I kept wondering if anybody would find it. Of course, nobody does this anymore. What's that? You have no idea what I am talking about? It’s the secret additional song on The Receders new CD. Now, I know you purchased at least three or four copies of it awhile back when I posted the big announcement. Everyone should have several copies. I keep one on my keychain. 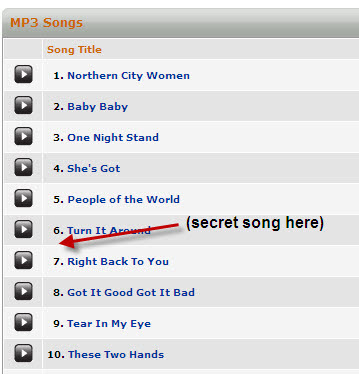 The secret additional song can easily be heard if you wait for “Turn It Around” to finish playing and then listen to 5 minutes of silence at nearly full volume. See how sneaky and technical we are? Of course, it’s a cover song and it has A LOT of cowbell in it. It’s a musical imperative that every secret song have cow bell and we didn’t let you down. Oh, and did I mention that it’s also a Doo Wop song done in Reggae style? And I’m singing? Now how could you miss that? Happy Summer Fools Day, by-the-way. April Fools Day is so yesterday. I was wondering how that could even be possible. You ARE weird. Thanks for the contest idea! I have posted my first contest, with an actual real prize even, for people to guess the baby's birth date, time, weight and length. If you want, you can keep your original guess, or I can move it to June 30, since it looks like she Jenni will be induced then. Of course, you never know what can happen between now and then. I thought he Doo Wop/Reggae sounded a little more like Flamenco/metal myself, do you think I should get my ear tuned? Wait, what? Is it a joke? My CD is in my car and I'm too lazy to go get it. Roger – I’m going to hold with my original date. I’m that stubborn! JD – It’s not really a joke until after I’ve made you get your CD. You made me listen to it again. Nice work. I must not have been paying proper attention. Now I shall have to hunt for it when we get home.